You love Asian food? So do we. This is our guide to the best foods in Asia! Taste is always subjective. One man’s spicy is another man’s uncontrollable, red faced pain. One woman’s sweet is another woman’s diabetic nightmare. As foodie travellers there is one thing we can promise – We’ve eaten a lot. In doing so, we’ve drawn a bunch of comparisons in order to compile this list. One year in Asia. Its been one hell of a journey, one which still continues. We’ve eaten fantastically well and we’ve discovered foods we’d never even dreamed of. There are a lot of great dishes that did not make the list. So, in no particular order, these are the best of the best foods in Asia and I’m going to tell you why. Burning. Explosion. Flavour. Searing. Amazing. That about sums up the consumption timeline of these bite size mouth volcanoes of infinite yum. If you can stand to wait – most can’t – then give them a few minutes to cool down first. We’ve had these in many places across China and other Asian countries. Shanghai is still the best. The Xiaolongbao, or soup dumpling, was featured on an episode of Anthony Bourdain’s “No Reservations”. Unlike the ones he tried, in a fancy restaurant, we ate at a regular hole in the wall sort of place. They were cheap, filling and perfect. Also unlike the giant ones he ate, first supping the juice with a straw, these are of a regular down-in-one size. They may not be the most famous in Shanghai, but you will not be disappointed. Tip: Go for the original pork filling – anything else just isn’t as good. South Korea is the most expensive country we visited for food over the last year. Although it is possible to get a meal for under $5 you’ll be stuck with some pretty basic chow. If you want a real taste of Korea then you can’t skip the BBQ. Fortunately, of all the places we tried, one of the best was also one of the best value at 10,000 won ($8.50) for the pork belly set meal. There menu is minimalistic. You either choose the pork belly or the ribs. Although other choices exist, I’m telling you, and so is every other customer in this always busy restaurant, those are the two choices. As with most Korean meals, this one choice is not all you are served. An incredible array of side dishes and condiments will arrive to envelop your table. A selection of shredded veg is placed at the drainage end of the grill. Every delicious drip of pork fat runs through and cooks the veg. Wow. The delicious and crispy pork belly is grilled and then eaten as a lettuce wrap with a mix and match of condiments and sides. Add some of the pork, fatted veg along with salt and the ubiquitous “red sauce” and you are looking at one of the best taste parcels in Korea. Wash it down with a glass of Soju for the authentic experience. Want to enjoy Seoul on a budget? Check out our guide for Seoul on $50 per day for two people. Price: 10,000 Won ($8.50) per person, plus 3,000 won for a small bottle of soju. Location: Its down a side street near directly south behind the Itaewon metro stop. There are loads of restaurants down that street, this one has a pig with its thumb up. Check the food map for precise location. When referring to Burmese salads, the word “salad” seems like a misnomer. What we are talking about here is a selection of nuts and vegetables covered in oil. It tastes way better than it sounds but you will not be losing any weight. Like any salad, the two main factors are fresh ingredients and an excellent dressing. The recipe for the dressing seemed to be relatively consistent in the many places we tried the various salads – a national Burmese secret perhaps. In any traditional local restaurant, even if not on the menu, just ask for one of the salads and normally they’ll throw one together. The ginger salad is literally chunks of ginger with nuts, crispy fried soya beans and maybe some tomato. The tomato salad is largely tomato and cabbage but also with plenty of nuts etc. too. What is Burmese cuisine? It’s not a nation that has had widespread international recognition. Read more about Burmese cuisine. Location: All over Burma, especially in Shan State. I’ve never been the biggest fan of eggplant. Even in moussaka, which I enjoy, I have to eat it whilst thinking “this doesn’t have eggplant in”, even though I know it does. In Hong Kong I was converted forever. It’s probably because, before the eggplant is added to the mix, it is deep fried. Then it is fried up with minced pork – vegetarian food is not really a thing in China – and a tomato based sauce. 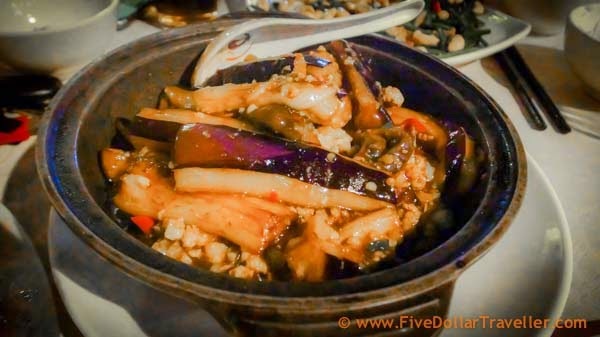 It’s another one of those dishes that you just don’t seem to find in a typical Chinese restaurant outside of China/Hong Kong but many restaurants in the Cantonese parts of China have it. Just show them the following text and get ready for a taste bud treat. Location: Food Map. 5 Fung Cheung Road, Yuen Long. A selection of street restaurants in this area in the evening. On the corner. There are only three times of day when Kesar restaurant is quiet, two of those are during the observed temple times, the other is when they are closed. Head in just before 7pm or just before 1pm to ensure you miss the rush. I’ve always thought the French were the kings of bread. Nothing better than a fresh baguette or croissant. I was wrong. Here, in this unassuming dhaba restaurant on a tiny backstreet of Amritsar, we found the lord of baking. For 40 rupees you get the crispiest, most buttery parantha (or “paratha”) bread in India, probably in the world. Just like pizza in Naples, a bread has changed my life and created a need to return to a city that has little else drawing me back. You’ll want something to dip that bread in. We reckon the Palak Paneer (Cheese and spinach curry) is one of the best curries at this place. The “dal fry” is a local favourite though we were not so impressed with it. You may come to Amritsar on a pilgrimage to the Golden temple, heartland of Sikkhism, but you’ll return again for the parantha. Price: 40 rupees (80 cents) for the amazing bread. 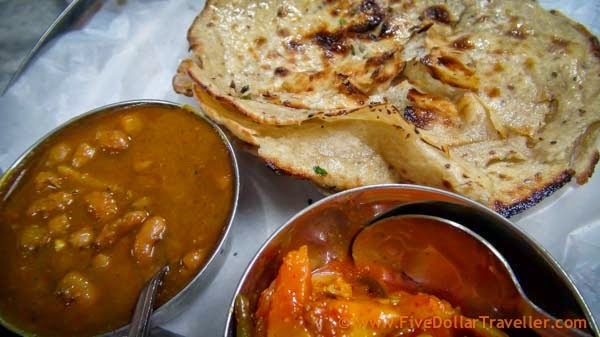 Curries to accompany start at around 30 rupees for a basic chana (chick pea) or Dal (lentils). We recommend the palak paneer for 100 rupees. Location: Kesar da Dhaba, Amritsar, India. Another simple, yet perfect dish – good for breakfast or as a snack. It’s all about the pastry. Although egg tarts are popular throughout China and other parts of the far east, there is a difference. Most of them are made in the Portuguese style, with flaky puff pastry. In Hong kong they are made with sweet, rich and buttery short crust pastry. Sorry Portugal, it’s not just because I’m English, seriously, the egg tarts aren’t as good in the UK either. The Hong kong interpretation of this classic is just better. Location: Any bakery, of which there are hundreds. From metro stations to down small residential streets. Chinese BBQ. The choices are endless. 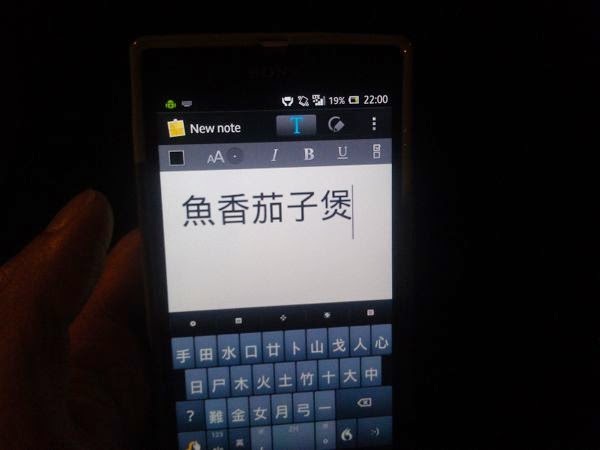 The availability is country-wide in China. For all the universal options, there was one, well two, BBQ items we just kept coming back to… Coriander (cilantro) leaves or enoki mushrooms wrapped in tofu (or sometimes bacon). The fragrant flavour of the coriander works perfectly with the neutral tasting tofu. It’s one powerful bite of herbal enjoyment. As for the Enoki mushrooms… They are mushrooms. When wrapped in bacon, well… its bacon. Enough said. Aside from the awesomeness of the BBQ items, the whole atmosphere of street BBQ in China keeps you coming back in itself. During summer months little plastic chairs everywhere are packed with people enjoying food, beer and a chat. It’s a massive social event. 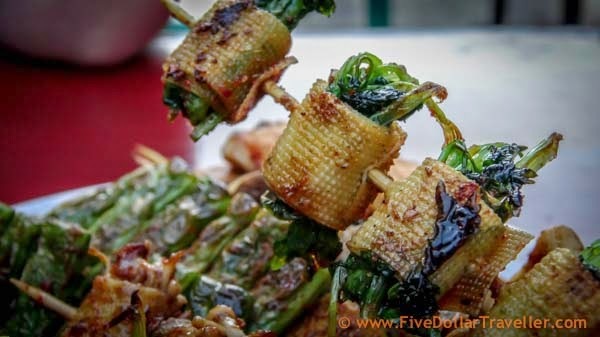 Location: During summer, about 50% of the ever pervasive street side BBQ stalls sell this. Some suggested areas are on the Food map. The Harbin University district was a particular favourite – including 2 liter jugs of draught beer for about 12 yuan ($2) too. This is not the end. Click below to see page 2 of amazing Asian dishes. Some of these International foods might not agree with your stomach – so please be careful and always have travel insurance in case you get sick. Read Our Guide Comparing Insurance Companies and get the right policy and price for you. What is Burmese Cuisine? What Myanmar Foods Should I Try?